IMAN’s work of service and organizing in Urban America is part of a long tradition of such work by the American, especially Blackamerican, Muslim community. The IMAN Health Clinic and our other health care work are also connected to and build on similar work being done in other cities. One such model that continues to inspire us is the health care and policy work being done through the growing efforts of the Health Unity on Davison Avenue (HUDA) Clinic run by the Muslim Center of Detroit. HUDA Clinic was founded in 2004 to serve the uninsured population of Detroit and is run by physicians, medical students, nurses, social workers and other members of the Detroit Muslim community. Inspired by the Muslim principles of compassion and service, HUDA Clinic’s mission is to promote health and wellness by providing quality and free health care, pharmaceuticals, and preventative services to the uninsured. While the Clinic provides services to the uninsured from the entire Detroit metro, it is located in the inner-city, in a community that has long suffered neglect and marginalization leading to extraordinarily high rates of unemployment and poverty. For many of these working poor and unemployed who have no health insurance, the HUDA Clinic is literally a lifeline. As IMAN moves toward broadening both its services/expertise in health care delivery and its impact on health care policy/debates, two separate delegations from IMAN have visited HUDA Clinic in the last three months. In August, leaders from IMAN took a tour of the Clinic and met with its Board members, while Rami Nashashibi, IMAN’s Executive Director, was a speaker at a fundraiser for the Clinic earlier in October. These recent contacts and meetings have reinforced earlier contacts between IMAN’s Health Clinic and the HUDA Clinic. Beyond a solid commitment to basic health care accessibility being a human right for all that can’t be compromised, IMAN’s leadership believes that there is also a shared understanding between the two Clinics that our health care work has to be both holistic–including culturally competent services, prevention, education–and systemic–including policy, advocacy and legislative work. Largely thanks to the critical support provided by Islamic Relief USA, we are approaching the one-year anniversary of the Health Clinic’s first Medical Director, Dr. Altaf Kaiseruddin, and we are moving ahead in both the holistic and systemic directions. Under the leadership of Dr. Kaiseruddin, the Clinic is on pace to expand its operations to 5 days/week and increase the number of patients by 67% by the end of this year. Efforts aimed at preventative care and community education are also picking up pace, with the second installment of the BodyWorks health and wellness classes offered at IMAN having just concluded. Another impact of this funding from Islamic Relief USA and the leadership of Dr. Kaiseruddin may be seen in the policy and advocacy work that IMAN is planning to do in the health care arena. “By allowing us to bring in the leadership of Dr. Kaiseruddin, Islamic Relief has helped to increase IMAN’s overall expertise in health care and, therefore, our ability to contribute to the broader conversation around health care options and policy,” said Mark Crain, IMAN’s Communication Coordinator. 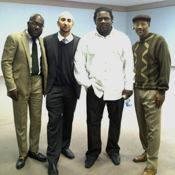 Long before IMAN conceived of projects like Green Reentry, there was an individual in the American Muslim community who used his stardom, passion for justice and love for the community to launch one of the most impressive urban renewal programs in the country. Kenny Gamble, also known as Luqman Abdul Haqq, has been a stalwart in the Philadelphia community for nearly 50 years. Beginning as the lead singer of the harmony group “Kenny Gamble and the Romeos,” he became, along with partner Leon Huff, one of the most prolific and influential song writers this country has ever known, penning over 3000 tracks, many of which became #1 R&B and Pop singles. His work ethic and commitment to his art earned him an induction in the National Academy of Songwriters Hall of Fame, as well as the Grammy for Lifetime Achievement. Along the way, he helped produce such historic musical acts as The O’Jays, Patti LaBelle and Teddy Pendergrass. However, while his music legacy is certainly still revered, Luqman Abdul Haqq is known in Philadelphia today for his contributions to the uplift of his community. In 1993, he co-founded Universal Companies with his wife Faatimah and embarked on creating a multi-faceted community development and urban renewal program that is reshaping an entire neighborhood. After opening one restaurant in South Philadelphia under Universal Companies, Gamble then opened a bookstore. He eventually purchased over 100 condemned and vacant properties and provided construction jobs to local residents to rehabilitate the properties and make them available for rental to low and middle income families. With his Jamiyat Construction Company, Gamble has already helped build one mosque in the neighborhood and is currently planning a second. The efforts of the Gamble family have helped produce Universal Business Center, a small businesses support center, Universal Institute Charter School, which opened in September, 1999 with 300 students and the Universal Community Employment Training Center, skills-training and job placement service for adults. “I remember coming back from South Philly and talking about Kenny “Luqman Abdul Haqq” Gamble to everyone who would listen. I was simply blown away and was even more shocked that many in the Muslim community hadn’t heard about this extraordinary story,” remembers IMAN’s Executive Director, Rami Nashashibi. 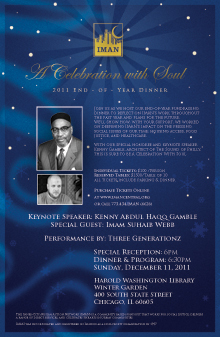 IMAN will be celebrating the legacy and paying tribute to Gamble for his work as both a visionary music mogul and co-founder of Universal Companies on Sunday December 11th when he visits Chicago to serve as keynote speaker for the organization’s end of year fund raising dinner at the Harold Washington Library’s beautiful “Winter Garden” hall. One of Kenny Gamble’s proudest moments in Philadelphia International history involves a song and album he recorded with the entire Philadelphia International Records roster, “Let’s Clean Up the Ghetto.” The song featured the vocal talents of Teddy Pendergrass, Billy Paul, the O’Jays, Lou Rawls, The Intruders, Dee Dee Sharp and Archie Bell. As part of the project, young people were hired to pick up garbage, paint over graffiti, and sweep dirty streets in their neighborhoods. After endorsement by the mayors of Chicago, Los Angeles, Memphis and Atlanta, the successful initiative was adopted by states throughout America. Among the proclamations the project received was one from Pennsylvania governor Milton Shapp, who reserved one week in August each year for “Clean Up The Ghetto Week.” “Let’s Clean Up the Ghetto” became an inspiration for Universal Companies.